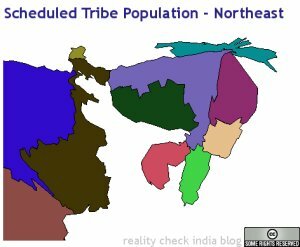 Note: See how the northeast is larger due to the large number of scheduled tribes. 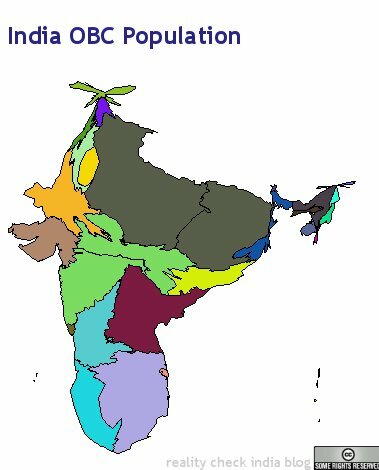 Lakshadweep is larger too because 94% of population is ST. Excellent. Great job. Since you have worked extremely hard for it, I will not point out that you have clubbed my home state Chhattisgarh with erstwhile MP. One particular data that I am always interested in is finding out the share of muslim OBCs who have benefitted after implementation of Mandal commission. What is the share of muslim OBCs who have got government jobs? Anoop, the main problem is that NSSO data is not available for Chattisgarh, Jharkhand, or Uttaranchal. 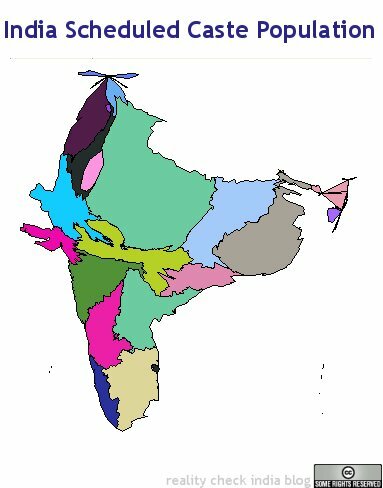 Another minor problem is that the GIS file I used did not contains shapes for those three states. This can be fixed later, if I pay money to buy a newer GIS map. So, I clubbed Uttranchal with UP, Chattisgarh with MP, Jharkhand with Bihar. Do you think this is not valid ? We may have to wait to check the Sachar committees report on Muslims in general. Again, that will be confusing because it may not separate muslim OBCs vs other Muslims (SC, FC). Do you have data from 20 years ago to show how this has changed, if at all? Ideally before framing far reaching policies, we should have trend data in place in addition to point data. We dont have either. Thanks. My fault for not following up on the links mentioned in your post. I read it later. Sachar committee indeed has segregation of muslim and non-muslim OBC. The muslim OBC question came to my mind because J&K was so small in OBC population, despite at least 30% muslims being in OBC categories. Realized it later that data was not available for J&K. Anyways, carry on the good work. I will use your research to make my point sometime. Great job. Will be a useful reference for future. Where is the original source for data? Especially, I want to see the source for OBC data. The source of OBC data is NSSO. You have to register on their site and download the document mentioned. I can understand how hard it must have been to get the data for these cartograms. That itself makes this a commendable achievement. Amazing work. Has there been any media interest in this? I can’t see why newspapers will not be interested in this. This is explosive stuff. Yeah, that’s why I asked. If we see a certain segment changing (growing or being removed/cleansed from a state) that could be very interesting. Thanks for this – at least now we have one data point for the future. Great work. 1) in the cartogram on obc population,the relative sizes of obcs population is meaured(by your admission).you have given the percentage of obc population to the total in some states in the note appended to the picture.but this masks differences between TN and UP.Both states have large obc populations. 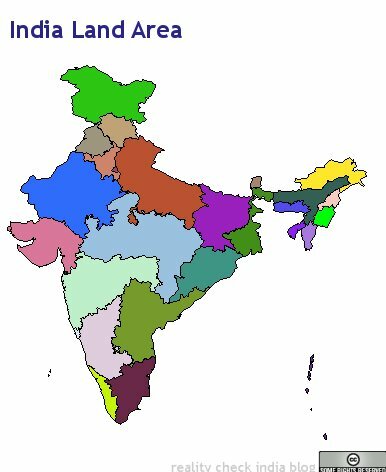 (UP is the most populous state).but in TN,the percentage of ‘obcs’ is much larger than in UP. (65% to 40%). 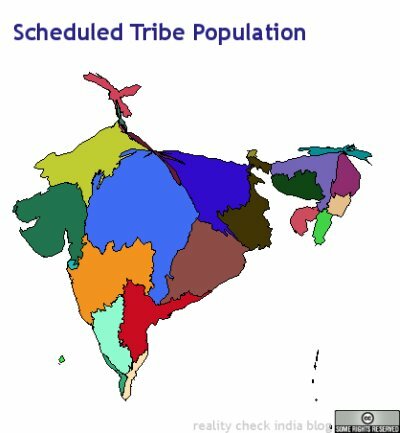 2) there is a substantial difference between ‘obcs’ in UP,Bihar,rajasthan,MP who are sharply demarcated from ‘savarnas'(atleast in the last 1000 years,the jats being the exception) and the obcs like gounders,thevars in TN who are peasant proprietors and who have always had access to political power and social authority.you have pointed this out several times. 3) ‘leakage’ is far more widespread in TN,where even vellalas,naidus and chettiars are enjoying the benefits of reservation,by passing off as backwards and getting obc certificates.you have pointed this out as well.how there is an escape valve for vellalas,naidus etc wherein they claim to be backward castes, which are subcastes of a larger grouping or they claim to be castes which have similar sounding names to which they have no relation.This is possible in the permissive atmosphere of TN,where the aim is to finish off one community. 4) it is particularly sad ,when otherwise ‘good’ and ‘talented’ persons acqueise in this travesty of truth and justice,motivated by tamil nationalism. 5)when thugs like vp singh give a chance,karu,ramadoss are not far behind. 2)obcs WERE sharply demarcated ..
2)obcs in north india WERE sharply demarcated .. I hear what you are trying to say. 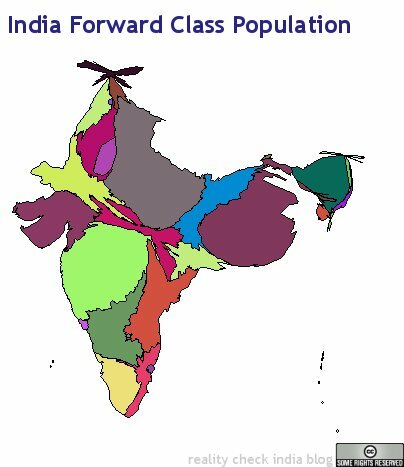 What you are interested in is not raw OBC percentages, but rather OBC sizes relative to the population share of each state. In other words, TN for example has 6% of Indias population but 12% of Indias OBCs. UP has 17% of Indias population, but 19% of Indias OBC. So, the ratio is much higher for a state like TN than for UP. Yes, but we cant gauge emotional things like social structure. Is my grandfather who cut 10 kgs of onions per day socially below someone elses who milked 10 cows an hour ? Or is it socially higher ? Can we decide ? If not who gets to decide ? Politicians these days are unwilling victims of their own devices. The only motivation is to win the next election. I firmly believe facts are the truth, and the truth shall set us all free. Benefits will reach the intended and the interests of people will start widening again. Getting these facts are not easy though. I have been trying to get access to the 1931 census data for a while now. 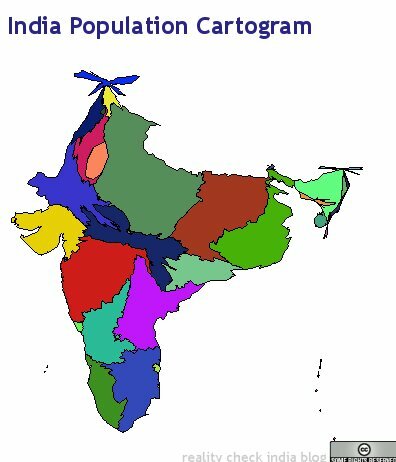 RC,(RealityCheck) you did a great job.. First time Im hearing about Cartogram…I havent heard about it in the middle of 4 year engg degree..